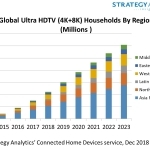 MILTON KEYNES, England--(BUSINESS WIRE)--The number of homes worldwide using an Ultra HD TV has now passed the 200 million mark, according to the latest research from Strategy Analytics’ Connected Home Devices service. 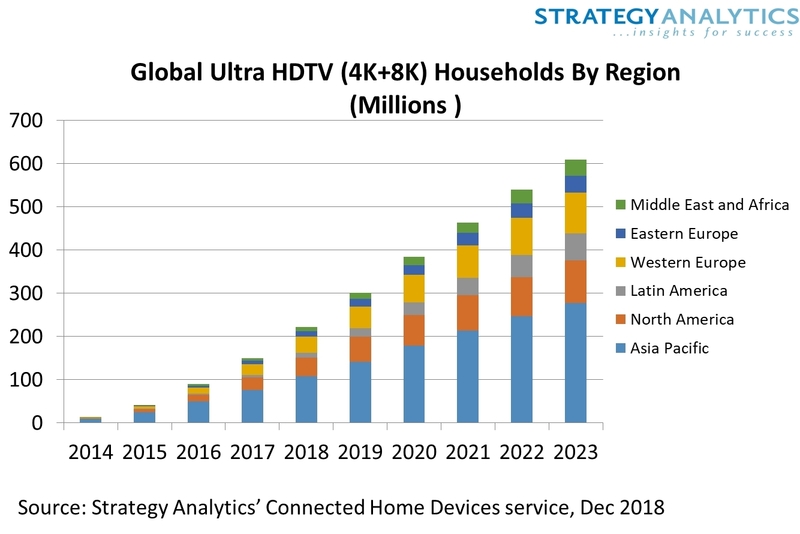 The report, 4K and 8K Ultra HDTV Global Market Forecast , predicts that 222 million homes will own an Ultra HD TV by the end of 2018, an increase of nearly 50% over the past twelve months. The report also forecasts that more than 600 million homes will own an Ultra HD TV by 2023. The vast majority of these homes will have a 4K display – only 3% of Ultra HD TVs in use will be 8K-ready by this time.